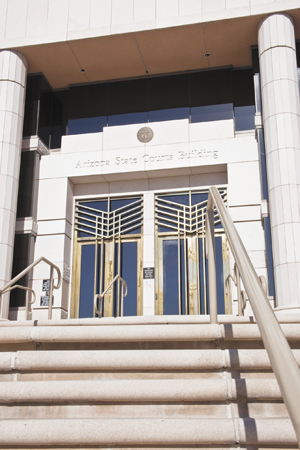 We are Arizona lawyers with several decades of trial practice experience. Despite the rumors, we are not judges; we have no direct connection with any courts except as lawyers who appear before them. (Semi-anonymous is probably more accurate, at least in our neck of the woods.) Two reasons. First, we are not doing this to publicize our practice; some do, and more power to them, but that is not our purpose. Second, we do not want anyone — you or us — to think that we will temper our analyses for fear of offending people we might end up appearing in front of. Do you review all the opinions? No, only the interesting ones. As explained in “About AAB,” we concentrate on civil cases. Once in a while we might have something to say about a criminal case. It is unlikely that we will ever comment on a domestic, industrial commission, mental health, or juvenile case since we rarely read them. Do you review your own cases? No, we do not review cases in which we acted as counsel or were in any way involved. We will note the existence of, but not critique, those cases if they are sufficiently important or if, for example, we’ve had something to do with a Supreme Court case that affects a blog we’ve already written. Why are your comments on Court of Appeals’ opinions sometimes delayed? When we are particularly critical of the reasoning of an opinion we do not like to post while people are presumably still writing their motion for rehearing, petitions for review, etc. Not that anybody is going to pay any attention to us anyway but we don’t want to be seen as trying to influence the outcome. Because we turned off the “comments” function of the blog (even though it may still say “leave a comment”; for some reason that doesn’t always go off). We don’t mean to start arguments; we simply post our views for people to read. Isn’t there a typo in your review of the such-and-such case? Yeah, maybe so; we don’t have copy editors and we do have day jobs that we need to spend most of our time at. We review these for typos before we post them and we correct typos (but do not change substantive comments) as we notice them later on. How can I print/email/share one of your blogs? Buttons for this are under the blog when it’s presented separately on its own page. Click the blog’s title to go there. If for some reason you need to reach us, email azappblog@azappblog.com. In the spirit of fierce independence, though, we pay no attention to criticism and rarely reply even to praise (not that we wouldn’t be thankful if we ever got any).